MUSEUM OF ARTS & DESIGN: Shown are No Man’s Land Brooch by Judy McCaig, Scotland/Spain; Dream & Reality Choker by Martha Vargas, Mexico; Reconstructed: Frame Brooch by Demitra Thomloudis, United States; Untitled Pendant by Kevin Hughes, United States; Three Days Walking (Mourning Brooch) by Julia Turner, United States; and Mexico Fingerprint by Cristina Celis, Mexico. Photographs courtesy of Velvet da Vinci. MUSEUM OF ARTS AND DESIGN hosts “La Frontera: Encounters Along the Border” through September 23. This international exhibition explores the US–Mexico border as a complex landscape of human interaction. Jewelry artists from Mexico, the United States, Latin America, and Europe expose the underlying currents of the border environment within geographic, political, economic, social, cultural, and ideological contexts. Border citizens share a history, traditions and livelihoods, and the United States relies on Mexican labor in a variety of industries. Yet Mexican immigration to the US is on the decline, and the prospect of an impenetrable border wall threatens to impact millions of people—transborder citizens on both sides, Mexican families already in the US and those seeking to cross in pursuit of a better life. The sixty-two pieces on display incorporate a range of materials, from metal, fiber and wood to medical equipment, pieces of green card and the caps of water bottles, to embody personal interpretations of the border journey. 2 Columbus Circle, New York, New York 10019; 212.299.7777; www.madmuseum.org. HEARD MUSEUM presents “Sonwai: The Jewelry of Verma Nequatewa” from October 6 through March 10, 2019. Verma Nequatewa (Hopi) began an apprenticeship with her uncle Charles Loloma around 1966. Nequatewa has signed her distinctive work with the Hopi feminine word for beauty, Sonwai, since 1989. It complements her uncle’s name, which was the masculine word with the same meaning. Nequatewa worked with Loloma for more than twenty years. Although her jewelry has been featured in the U.S. and internationally, this will be the first comprehensive exhibition of her work. PHOENIX ART MUSEUM hosts "Ultracontemporary" from October 27, 2018 through March 24, 2019. Through the support of Arizona Costume Institute, the museum has recently had the opportunity to acquire a selection of current fashion designs that do not only represent excellence in design but are also reflections of the changing cultural ethos of our time. Featuring works by Gucci, Comme des Garçons, Yeohlee and Iris van Herpen among others in a multi-media installation, the exhibition reveals how fashion is responding to an increasingly diverse and fluid global society. THE BOWERS MUSEUM hosts “Knights in Shining Armor” from September 22 through January 13, 2019. The exhibit displays ninety full suits of armor, helmets, corselets, shields, swords, and paintings on loan from the Museo Stibbert of Florence, Italy. These sets of armor date from the Medieval and Renaissance ages to the Romanticized Medieval revival of the 1800s. THE DE YOUNG MUSEUM features “Contemporary Muslim Fashions” from September 22 through January 6, 2019. The exhibition traverses different religious interpretations and cultures, including high-end fashion, streetwear, sportswear, such as the burkini, and commissioned garments from emerging and established designers. Also showing is “Fans of the Eighteenth Century,” through April 28, 2019, which explores these accessories that reached their peak in eighteenth-century Europe. MINGEI INTERNATIONAL MUSEUM features “Israel: 70 Years of Craft & Design” through September 3. The exhibition explores the art and innovation of the nation’s diverse people through a range of objects of daily use. Over one hundred examples are shown, including Yemenite jewelry, Bedouin textiles, contemporary garments, sustainable and industrial design, adornment incorporating ancient materials, furniture and ceramics. 1439 El Prado, San Diego, California 92101; 619.239.0003; www.mingei.org. THE DENVER ART MUSEUM presents "Dior: From Paris to the World" from November 19 through March 3, 2019. The exhibit surveys seventy years of the House of Dior’s legacy and its global influence. A selection of more than one hundred seventy-five couture dresses, as well as accessories, costume jewelry, photographs, drawings, runway videos, and other archival material, will trace the history of the haute couture fashion house, its founder, Christian Dior, and the subsequent artistic directors who carried Dior’s vision into the twenty-first century. SCAD FASH MUSEUM OF FASHION AND FILM hosts “Pierre Cardin: Pursuit of the Future” through September 30. Best known for his 1960s space-age style, Cardin pushed the boundaries of fashion by exploring new materials and silhouettes. The exhibition presents iconic looks for both women and men from the 1950s to present, borrowed mainly from the Pierre Cardin Museum in Paris, and includes several dresses from the SCAD Permanent Collection. FULLER CRAFT MUSEUM hosts “Uneasy Beauty: Discomfort in Contemporary Adornment” from October 6 through April 21, 2019. The exhibit brings together seventy-five examples of contemporary jewelry and costume that demonstrate the power of adornment to impact us physically, emotionally and intellectually. Showcasing wearable work in various media from regional and national artists, the exhibition will explore the outer limits of comfort through works that constrict body movement, irritate the skin or touch upon sensitive cultural nerves. MUSEUM OF FINE ARTS, BOSTON presents "Boston Made Arts and Crafts Jewelry and Metalwork" from November 17 through March 29, 2020. Beginning as a reaction against the dehumanizing effects of industrialization, the international Arts and Crafts movement spurred a renaissance of handcraftsmanship in Boston at the turn of the twentieth century. As part of this movement, the city quickly emerged as one of the most active and influential artistic jewelry-making and metalworking communities in the nation. 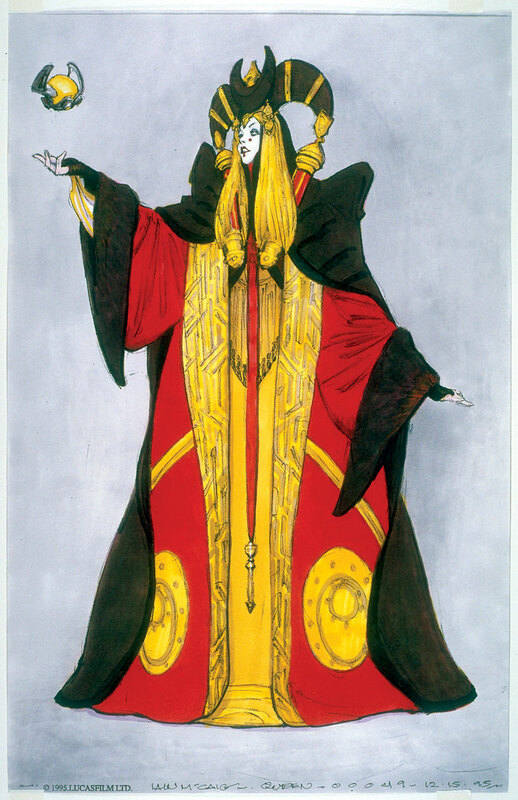 THE DETROIT INSTITUTE OF ARTS presents “Star Wars™ and The Power of Costume” through September 30. This traveling exhibition closely examines the process of costume design for iconic outfits featured in the first seven films of the Star Wars saga—from Queen Amidala’s gowns, which often incorporated Mongolian influences, to Darth Vader’s imposing black armor. Explore some of the world’s most iconic cinematic costumes of science fiction, including Queen Amidala, Chewbacca, X-wing pilots, Rey, and droids, including C-3PO and R2-D2. More than sixty original costumes, as well as concept art of character designs, are on display. 5200 Woodward Avenue, Detroit, Michigan 48202; 313.833.7900; www.dia.org. THE ALBUQUERQUE MUSEUM presents “American Jewelry from New Mexico” from through October 14. The exhibit features approximately three hundred objects, documenting aspects of jewelry adornment from prehistory to the present. Focusing on the interactions between New Mexican artists and their neighbors, the relationship between creativity and connection is demonstrated in the wide range of work on display. 2000 Mountain Road Northwest, Albuquerque, New Mexico 87104; 505.243.7255; www.albuquerquemuseum.org. THE WHEELWRIGHT MUSEUM OF THE AMERICAN INDIAN hosts “Peshlakai Vision” from through October 7. Norbert Peshlakai is a fourth generation Navajo silversmith known for his miniature silver pots and jars shaped like pottery. The exhibition features over one hundred pieces, including jewelry, vessels and small sculptural works, some inlaid with precious materials and marked with Peshlakai’s signature stampwork. Throughout the exhibition, his stamping skills will be demonstrated through patterns and scenes rich in symbols. 704 Camino Lejo, Santa Fe, New Mexico 87505; 505.982.4636; www.wheelwright.org. MUSEUM AT THE FASHION INSTITUTE OF TECHNOLOGY, NEW YORK: Shown are a 1954 evening dress, a dress by Gucci, a 1937 dress by Charles James, and a pink silk taffeta afternoon dress from 1857. Photographs copyright of The Museum at FIT, NYC. THE METROPOLITAN MUSEUM OF ART presents “Heavenly Bodies: Fashion and the Catholic Imagination” through October 8. Serving as the cornerstone of the exhibition, papal robes and accessories from the Sistine Chapel sacristy, many of which have never been seen outside the Vatican, will be on view in the Anna Wintour Costume Center. Fashions from the early twentieth century to the present will be shown in the Met’s Medieval and Byzantine galleries and at the Met Cloisters alongside religious artworks, to provide an interpretative context for fashion’s engagement with Catholicism. The museum also features “Spirited Creatures: Animal Representations in Chinese Silk and Lacquer” through July 22. The exhibition displays twenty textiles and fifty lacquers spanning several hundred years. 1000 Fifth Avenue, New York, New York 10028; 212.535.7710; www.metmuseum.org. MUSEUM AT THE FASHION INSTITUTE OF TECHNOLOGY, NEW YORK shows “Pink: The History of a Punk, Pretty, Powerful Color” through November 17. Although pink is popularly associated with little girls, ballerinas, and all things feminine, the stereotype of pink for girls and blue for boys only really gained traction in the United States in the mid-twentieth century, and the symbolism of pink has varied greatly across world history. By placing men’s, women’s and children’s pink clothing from both Western and non-Western cultures—including India, Africa, Mexico, and Japan—in a historical context, the exhibit corrects popular misconceptions, encourages viewers to question clichés and demonstrates that “It is society that ‘makes’ color, defines it, gives it meaning”—to quote color historian Michel Pastoureau. LEEKAN DESIGNS has announced that after more than thirty years in business, they will be shuttering their storefront this year. A closing sale begins in September. Proprietors Paddy Kan and Anne Lee will maintain a limited set of merchandise on the second floor of the same address, open by appointment. THE MINT MUSEUM RANDOLPH hosts "African-Print Fashion Now! 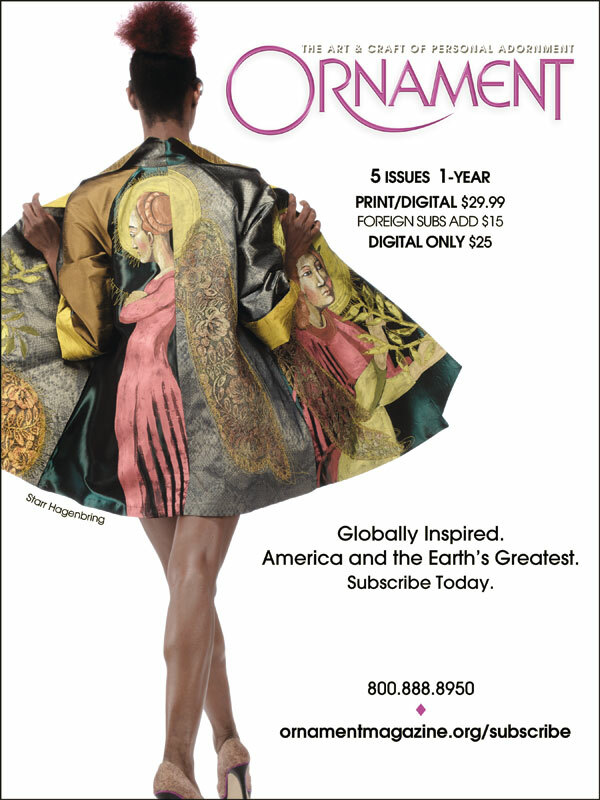 A Story Of Taste, Globalization, and Style" from October 5 through April 28, 2019. The exhibition introduces visitors to the Indonesian and Indian roots of these distinctive cloths and to the Dutch and other European printed versions of wax resist Indonesian batiks, which appealed to late nineteenth- and early twentieth-century African consumers. This type of printed cloth became central to many “popular” fashion systems in West and Central Africa in spite of its foreign history. The exhibition narrative follows this story to the present, revealing the cloth’s later association with emerging African national identities, its popular use in tailored ensembles, and its continuing appeal to today’s fashion conscious African women—as well as to internationally renowned African fashion designers. MÜTTER MUSEUM hosts “Woven Strands: The Art of Human Hair Work” through September 16. A favored folk art of the eighteenth and nineteenth century, hair art was a sentimental expression of grief and love, usually created by women whose identities have become anonymous over time. Human hair (from both the living and deceased) was used to form flower bouquets, wreaths, braided jewelry chains, weeping willows, and painted scenes of mourning. Considered to be a form of portraiture, these were cherished tokens to preserve the memory of a deceased loved one, chart a vibrant family tree of the living, or to be traded as friendship keepsakes. From six private collections, the museum along with John Whitenight and Evan Michelson have assembled hair art and jewelry, as well as accompanying materials that evaluate and consider the social expectations of Victorian-era mourning rituals that ruled nineteenth-century society with strict standards. 19 South 22nd Street, Philadelphia, Pennsylvania 19103; 215.560.8564; www.muttermuseum.org. THE PHILADELPHIA MUSEUM OF ART presents “Fabulous Fashion: From Dior’s New Look to Now” from October 16 through March 3, 2019. The pieces in the exhibit—daywear, bridalwear and more—showcase the museum’s extensive costume collection, and date from 1947, the year of the introduction of Christian Dior’s revolutionary “New Look,” to recent ensembles by designer Bernhard Willhelm. FACERE JEWELRY ART GALLERY celebrates its annual collaborative exhibition between jewelry and print in “Signs of Life,” October 3 – 23. This year’s exhibition and publication features artists Jenine Bressner, Daniel DiCaprio, Kirk Lang, Maia Leppo, Tara Locklear, Megan McGaffigan, Kranitzky & Overstreet, Melinda Risk, and Liaung-Chung Yen, and writers Claudia Bach, Ellen Beals, Stuart Greenman, Holly J. Hughes, Sharon Mentyka, Matthew Nienow, Roz Ray, Molly Thornton, and John Mark Tucker. THE SEATTLE ART MUSEUM presents “Peacock In The Desert: The Royal Arts of Jodhpur, India” from October 18 through January 21, 2019. The exhibit explores the artwork of the kingdom of Marwar-Jodhpur in the northwestern state of Rajasthan. Some two hundred fifty paintings, decorative arts, tents, canopies, carpets and other textiles, jewelry, and weapons will be presented beside large-scale photomurals which evoke the setting of the Mehrangarh Museum in Jodhpur. The exhibition is organized by the Museum of Fine Arts, Houston, in collaboration with Mehrangarh Museum Trust. WATERGATE GALLERY hosts “BLUE75” from September 8 through October 6. The show exhibits the shell jewelry of designer Sylvia Gottwald, featured artist in Ornament, Vol. 37, No. 2, 2014, and the paintings of Marcela Olivia Dorantes. The gallery exhibits contemporary paintings, sculpture, ceramic, jewelry, and fiber art, located in the historic Watergate complex next to The John F. Kennedy Center for the Performing Arts. 2552 Virginia Ave., N.W., Washington, D.C. 20037; 202.338.4488; www.watergategalleryframedesign.com. FACERE JEWELRY ART GALLERY: Shown is Reflecting on the Moment Brooch by Kranitsky & Overstreet. ORNAMENT MAGAZINE AWARDS: Shown are Patrick Benesh-Liu, Biba Schutz, Carolyn Benesh, and Robin Davisson. THE POWERHOUSE MUSEUM features “Reigning Men: Fashion in Menswear, 1715–2015” through October 14. The exhibit explores the history of men’s fashionable dress from the eighteenth century to the present, celebrating a rich history of restraint and resplendence in menswear, and re-examines the association of fashion with femininity. 500 Harris St., Ultimo, New South Wales, Australia 2007; 61.02.9217.0111; maas.museum/powerhouse-museum. THE DESIGN MUSEUM: Shown are an installation view and Yasmin Le Bon in Alaïa for The New York Times Magazine, “Paris Panache” editorial by Peter Lindbergh, Paris, 1985. Photograph courtesy of Peter Lindbergh. Installation photograph by Mark Blower. THE DESIGN MUSEUM hosts “Azzedine Alaïa: The Couturier” through October 7. The Tunisian-born couturier Azzedine Alaïa enjoyed his role as an outsider in the world of fashion. This exhibition, conceived and co-curated with Alaïa before his death in November 2017, interlaces stories of his life and career alongside personally selected garments, spanning the early 1980s to his most recent collection in 2017. Sensuous, body-hugging forms, described as “second-skin dressing,” are Alaïa’s enduring influence. Unlike many of his contemporaries, Alaïa personally constructed each garment by hand. His collaborative approach earned him a unique client list, including Lady Gaga, Tina Turner, Greta Garbo, Grace Jones, Michelle Obama, and Rihanna. 224-238 Kensington High Street, Kensington, London W8 6AG, England; 44.20.3862.5900; designmuseum.org. she wore reflected the identity she created. RIJKSMUSEUM VAN OUDHEDEN presents “Ancient Europe” through March 2019. Swords from Denmark, rare Scythian jewelry, German grave finds from the Merovingian Age, celts, and Hungarian artifacts from the now-closed National Museum of Antiquities are on display. Rapenburg 28, 2311 EW Leiden, Netherlands; 31.71.516.3163; www.rmo.nl/english.